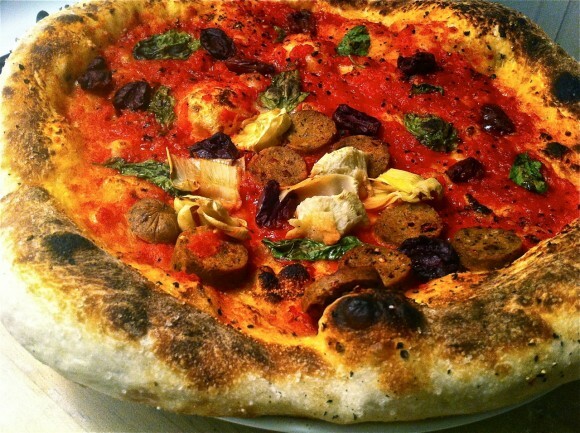 In my search for pizza perfection, I recently got a Mario Batali cast iron pizza pan. Last night, for a trial run (but not following the regular directions), I placed it in my broiler, pre-heated it on high for 20 minutes, then prepped a pizza using Trader Joe’s pizza dough (left out for a couple hours to warm up). Normally their dough is too sweet for my liking, so I gave it a fair salt and peppering before adding sauce and toppings (still no cheese in my diet, and still loving it). Milled some Cento tomatoes (They’re the most consistently good canned tomatoes I’ve found — I even have a “subscription” for them from Amazon, get a case every two months), and added a few kalamata olives, basil, and a small section of tofurky sausage. Cooked it for 4 minutes 45 seconds on “high” broil setting. The results were phenomenal. Crispy outside, doughy interior. Nice amount of puff. The bottom toasted nicely. 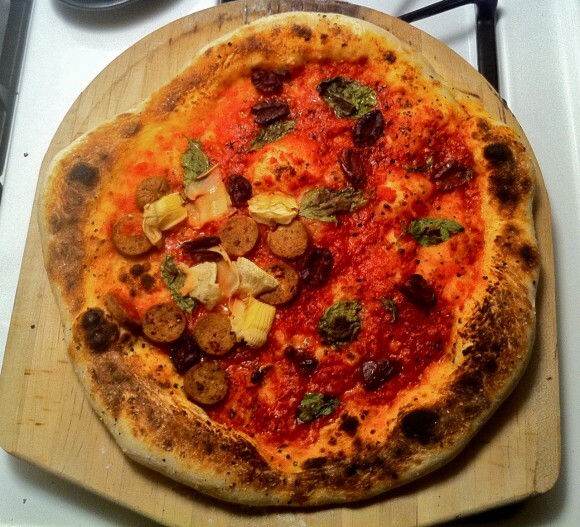 Interesting to compare the results of this iron pan to a pizza stone. I’m not really using it the way it’s intended, but by putting in the broiler, it just works. 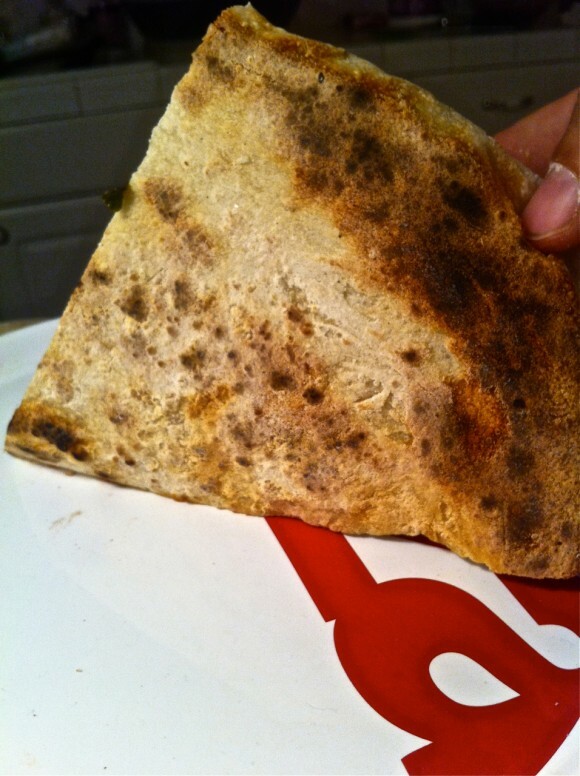 I’ve tried the same thing with a pizza stone, but it heats too high and burns the dough. I may have to test that again, but for now, I think I’ve found my new “quickie-pizza-fix” solution. 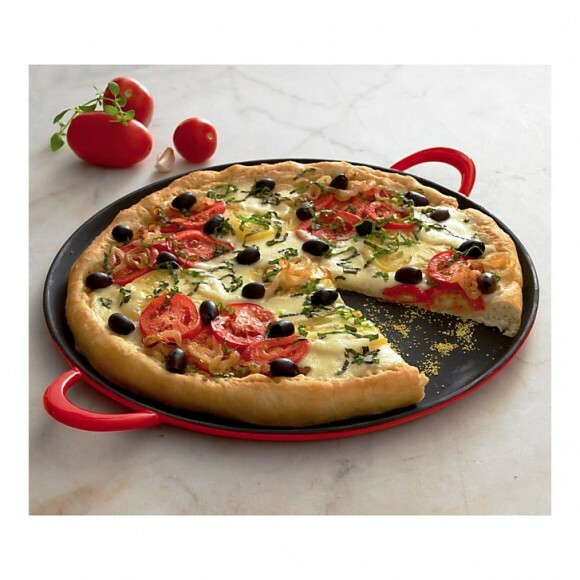 This is the pan I got; I stole this pic from the Crate and Barrel website--not too impressed with the pizza they're demo'ing in it. 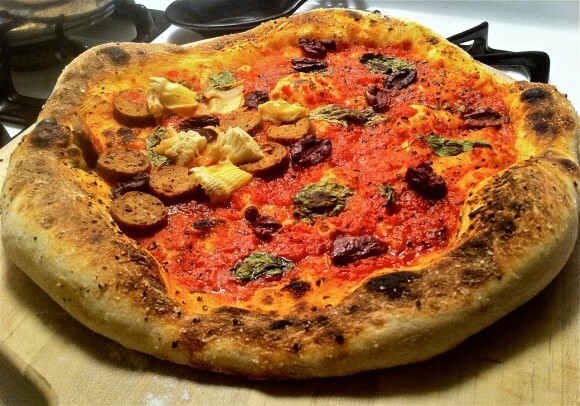 Quick question just to clarify – as that pizza looks awesome – you heated the pan for 20 minutes first, preassembled the pie separate and then fit it into the pan and cooke for approx. 5 more minutes? I’m thinking I already have a big cast iron skillet – and would like to try this.